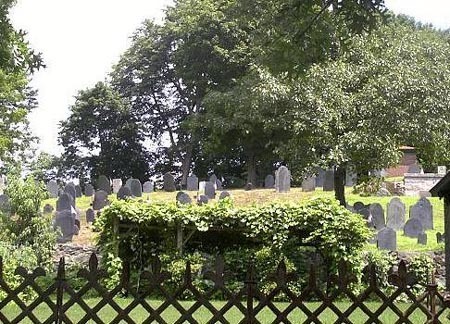 For visitors looking to discover monuments from the Revolutionary War the Old Hill Burying Ground dates from 1677 and includes many soldiers' graves from the Battle of Lexington and Concord. It is on a steeply sloping piece of land adjacent to what is now Holy Family Church in Concord Center. If one is looking for a pristine view of Historic Concord Center this is the place to be. On top of the hill one can take in the the broadest single view of the many remarkable structures that surround the Town Commons and Main Street. British Generals were said to have set up their post atop this hill during the initial stages of the Revolutionary War in April 1775 but not, as they had intended, to oversee a victory but rather, a retreat. Near the back slope of this cemetery is Bedford Street. Across Bedford Street one can find Sleepy Hollow cemetery where literary notables, Louisa May Alcott and Nathaniel Hawthorne are buried.